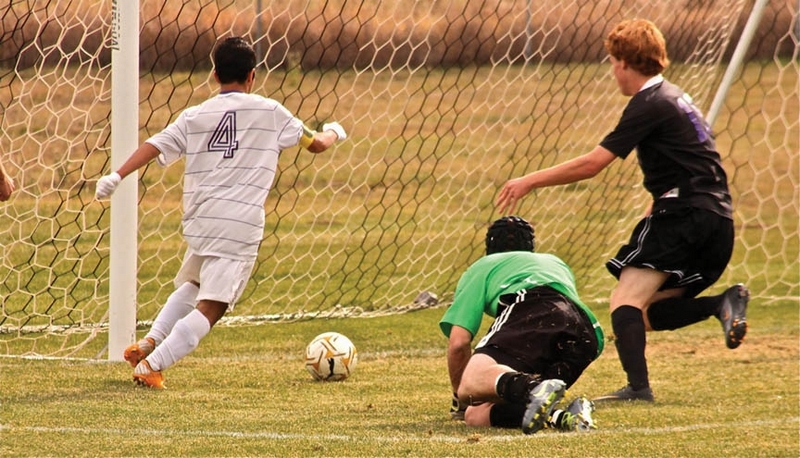 Jim Ryan/Special to The Aspen TimesLonghorns junior Willy Salamanca sprints in for a goal during Saturday's 4-1, 3A state tournament second-round victory over Lutheran at Basalt High School. BASALT – Time and again, the Basalt soccer team has reached this point. It has proven it can compete with the state’s elite programs. Now, it’s time to take the next step. Now, it’s time to “get over the hump,” head coach Brent Hayes asserted Wednesday afternoon. A golden opportunity awaits today. The sixth-seeded Longhorns, fresh off a 4-1 victory over No. 22 Lutheran on Saturday in the second round of the 3A state tournament, travel to Englewood to take on third-seeded Kent Denver at 3 p.m.
At stake for Basalt: the school’s first semifinal berth since 2005. “We belong in this tournament, but this is the step that always kills us,” said Hayes, whose Longhorns have been ousted in the quarterfinals in four of the last five seasons. Basalt (14-1-1), which pulled out a dramatic one-goal victory over No. 27 Telluride in its postseason opener, proved that Saturday. The Longhorns struck for two early goals against the Lions and dominated possession for the final 40 minutes in an impressive victory. “If we play the way we did against Lutheran, I like our chances against anyone,” Hayes said. Lions coach John Amschel, whose squad played the Sun Devils earlier this season, agreed. “I’d say Basalt has more speed, but Kent is very disciplined and very well coached. They’ve got some great players there,” Amschel said. Kent Denver survived a scare of its own Saturday. It trailed No. 14 Jefferson until the 76th minute, when a red card on a hand ball led to a game-tying goal by Kiefer Solarte. Now, Kent Denver (13-2-1) will host a Longhorns squad it outlasted, 1-0, in 2007’s quarterfinals at Justin DeSorrento Memorial Field. The rematch will feature two of the state’s most stout defenses. The Sun Devils, whose two losses came to Colorado Springs Christian and Faith Christian – the state tournament’s No. 1 and 5 seeds, respectively – have surrendered just nine goals. Basalt has allowed 10. “Something’s got to give,” Hayes said. “If we can get our speed unleashed, it will be good. Four of the nine goals scored against them came in the last three games, so they seem a little more vulnerable recently. To that end, Hayes has been imploring his players to focus on the little things this week – namely executing short, controlled passes, not diving in and defending set pieces. He’s also been trying to keep the mood light. Basalt should have some added motivation: It is the lone public school still in contention. Private schools have won four of the last five state titles. “I don’t like to dwell on those things, but I do like to mention them. … Whatever you can use,” Hayes said. “We’re probably the only school left with kids that get free or reduced lunch and have any diversity whatsoever. When we go to Denver, my boys are astounded by the lack of color and the huge stadiums.